Eight colors in a basic small tile pattern. Three poured floors with a concrete texture. Backless bench seating for decks, parks and patios; affordable and low vertices so can be used in multiples. 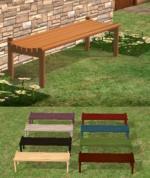 Zip includes recolors in light wood, dark wood, white, black, purple, red, green and marine blue. Large modern home with 4 bedrooms, 3 baths, loft, bonus room, sunroom, den, entry hall, formal living or dining room, kitchen and greatroom, 2 car attached garage, pool, lots of patio space, and a small garden. Contains the basics to keep your parched sims well watered. Contains necessary object recolors and custom textures. 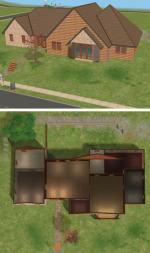 Set of 5 Walls and 4 Floors - seamless repeat. 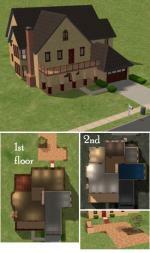 Two story with 3 upstairs bedrooms plus bath and bonus room adjoining master for nursery or private bath. Downstairs includes greatroom, bath and family room. Large garage is great for storage, a workshop or a home based business. Deep lot includes patio with plenty of room for later additions, pool etc. Single story with a master on one side and two bedrooms on the other, includes greatroom, plus small study or den and family room. Room for a garage or carport.